Seven miles south east of Arras, and now just to the east of the A1 – the Autoroute du Nord – the village of Heninel was captured by the British on 12th April 1917, four days into the Battle of Arras. In the fields directly to the east of Heninel, five British cemeteries tell the tale of the fighting here in the spring of 1917, and, unlike the men who have lain here for nearly a hundred years, I was lucky enough to find myself in one of them, if only for a few minutes, just a couple of months ago. Cross of Sacrifice. 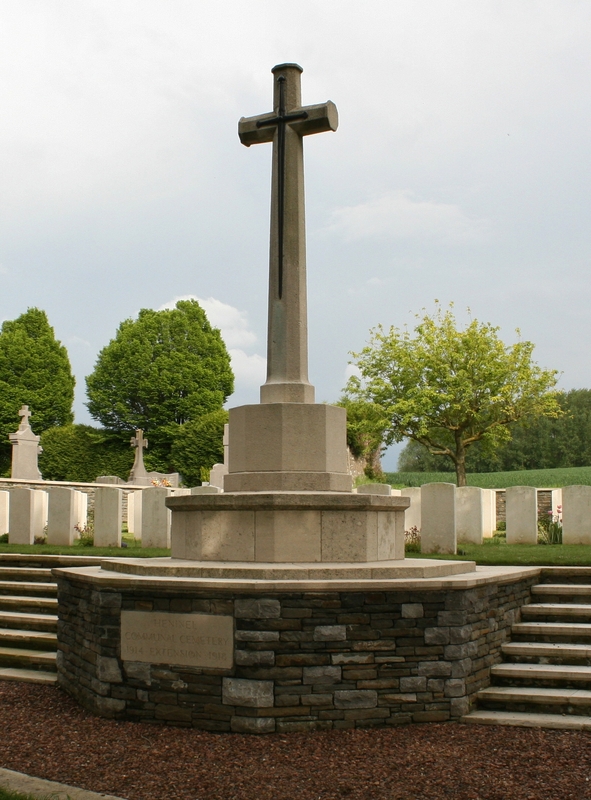 I haven’t mentioned for quite a while that the Cross of Sacrifice that we come across whenever we visit the British cemeteries in Belgium and France came in four sizes – quite literally small, medium, large & extra large – depending on the size of the cemetery in which it was to be erected. 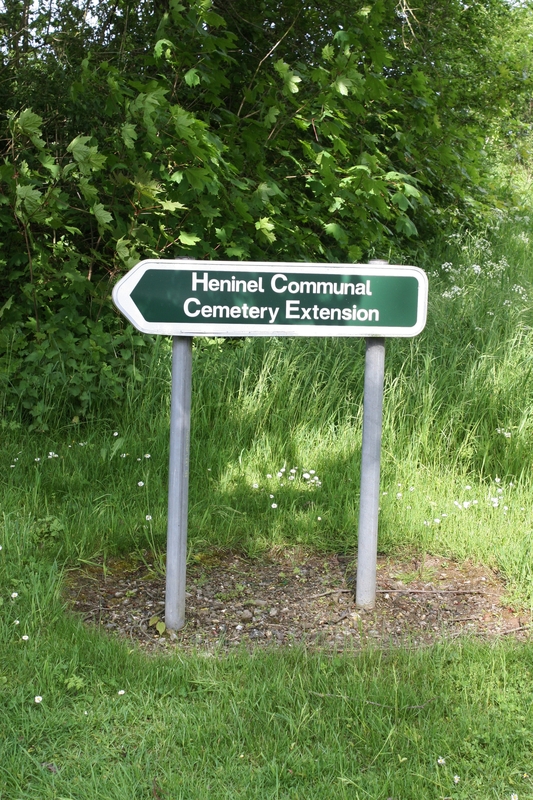 Of the five cemeteries, the nearest to the village is Heninel Communal Cemetery Extension, where 140 men, all but seven identified, are buried. We were here to pay our respects at the grave of a Captain in the Queen’s, Hugh Richard Longbourne D.S.O., killed by a sniper’s bullet near Chérisy on 3rd May 1917. Hugh Longbourne had help to raise, and later commanded, a company in the Hunts Cyclist Battalion in February 1914, and had transferred to the Queen’s in 1916. He was awarded the D.S.O. for action on 28th September 1916 near the Schwaben Redoubt at Thiepval when he “crawled to within twenty five yards of an enemy strong point and bombed the enemy with good effect. Later, with a sergeant and a private, he rushed the strong point, capturing a machine gun and 46 unwounded prisoners.” He was also later Mentioned in Despatches and in April 1917 he was presented with the Silver Medal for Bravery (Montenegro). 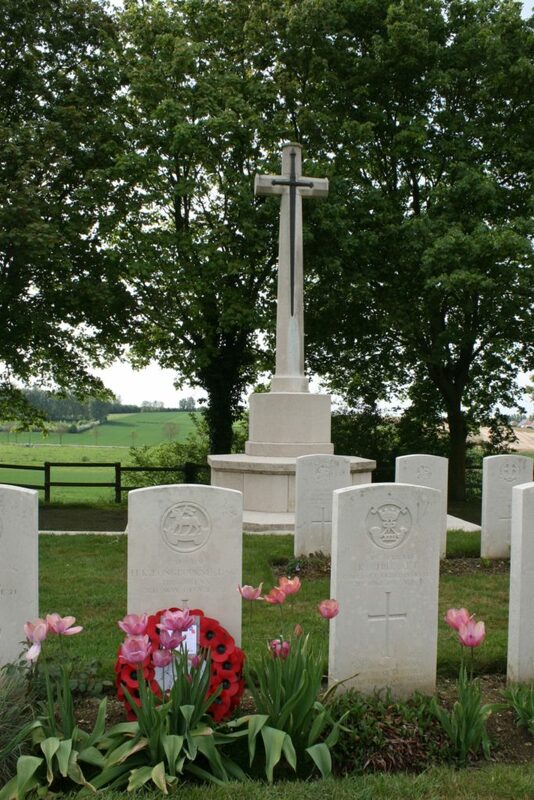 Heninel village fell in a snowstorm to the men of the 56th (London) Division & the 21st Division, but the first burials made in the cemetery were of some of the men who relieved them, the 50th (Northumbrian) Division, who advanced from Heninel on 13th April to capture the strategically important Wancourt Tower, which would fall the following day. 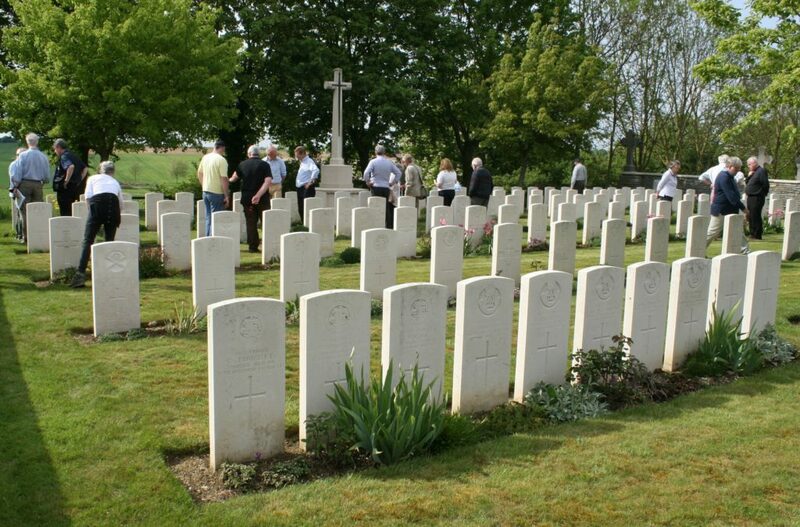 Thirteen men buried here were killed on 14th April. 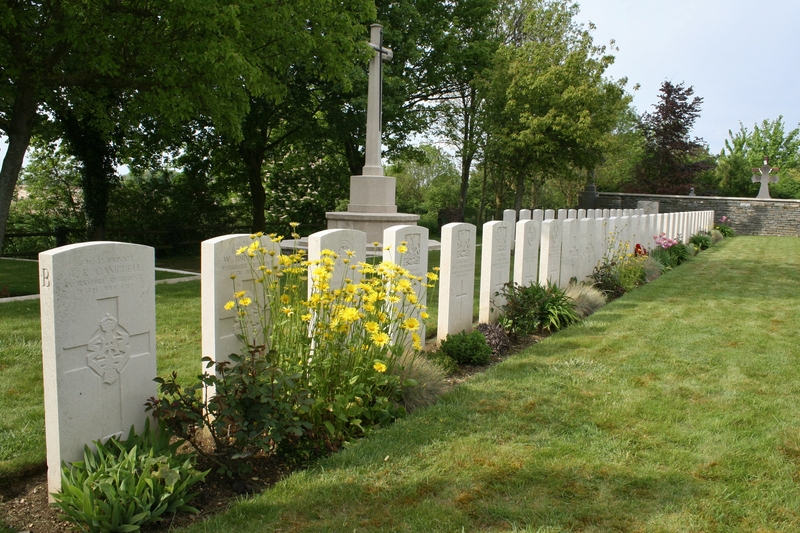 The cemetery was used until the end of November, when the three Tyneside Irish (Northumberland Fusiliers) burials nearest the camera in this row were made, alongside four Durham Light Infantrymen killed on 14th April. 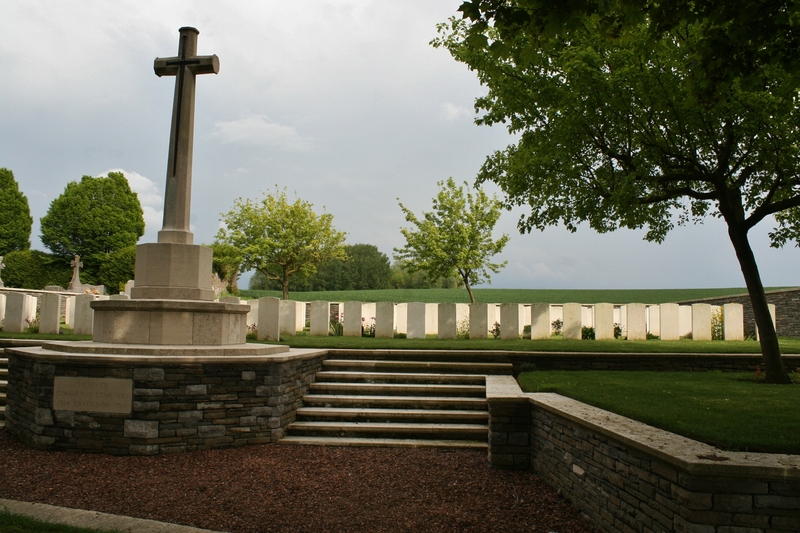 You’ll have spotted the communal cemetery by now, beyond the wall in the background. The other earliest burials from 14th April are in the row nearest the camera above. The cemetery plan can be viewed, courtesy of the CWGC, here. As the rest of the party headed back to the coach I, of course, lagged behind briefly to get a few shots of the cemetery sans people (you noticed them, I take it? The photos, not the people!). At which point I hear Tony yelling at me to come and see what he’d found, as he scrabbled around with his fingers in the bank running alongside the track leading back to the main road. That’ll be a Mills Bomb then, Tony. Grenade, if you like. But you know that, you’re an Army man. Shall we not touch it any more, though? Right, photos taken, I’m off (exit rapidly stage left). And not only that. 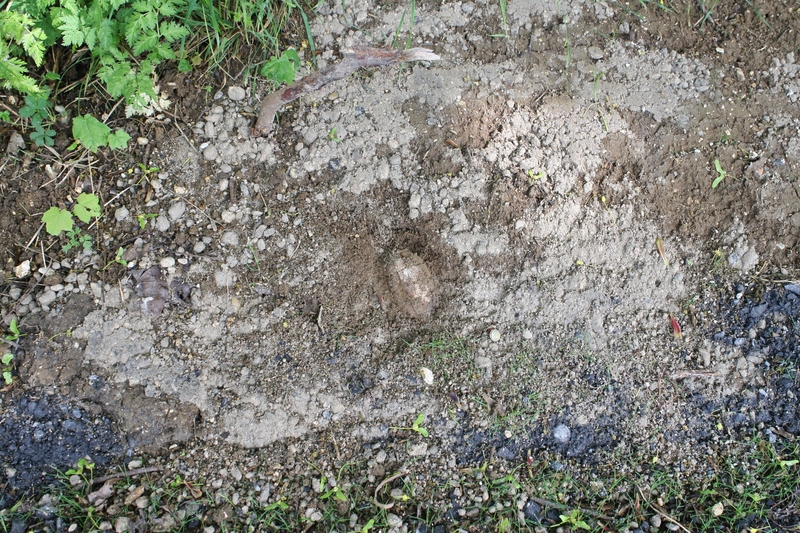 This was one of Duncan’s spots on the way up to the cemetery. British Lewis gun ammunition drum, with unfired bullets. Presumably thrown to the side of the field by the local farmer. And to finish, the ubiquitous CWGC signpost……because it would have been a rubbish way to start the post. This entry was posted in Arras. Bookmark the permalink. It looks as if some of that ammunition was live, do you know if it was? 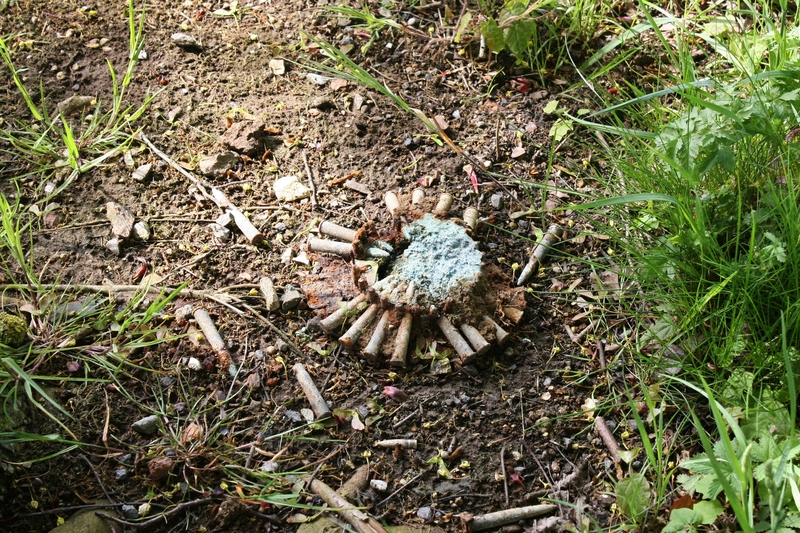 I have last week found some spent 303 shells on the woods at Limpsfield. Oh yes Peter, all well and truly live. Any ideas on why there should be 303 rounds in Limpsfield? The area was used, as I have been told by Canadian army and the local home guard. As a school child we were given talks about all sorts of ammunition and not to touch if found, but report them. I figured it was probably the Canadians – they were all over Surrey! If you put Witley in the Search Box you’ll see some more evidence of the Canadians in Surrey during the Great War, some of which you’ve seen already, if you get my drift. That Mills bomb looked a little sinister! Do you need to report those finds to anyone? More than a little. It was a slightly uncomfortable experience seeing someone fiddling about with it. 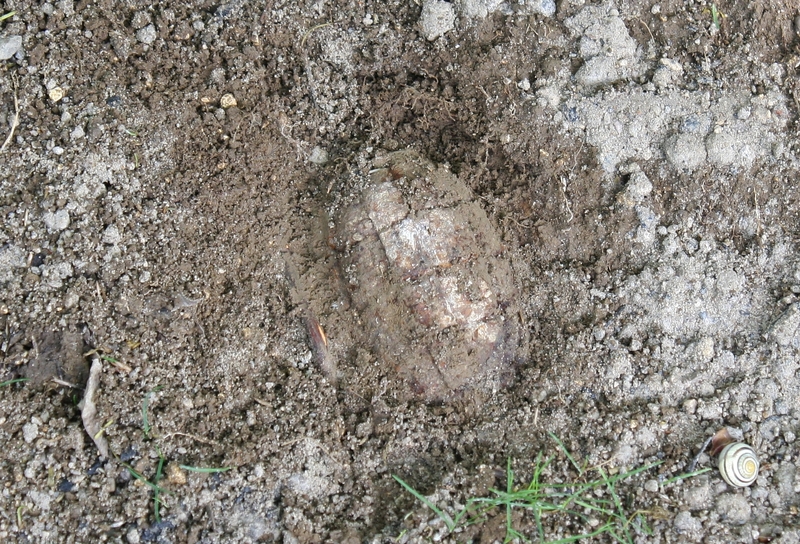 And no, I discovered many years ago that no one wants to know when you report such things, I suppose because so much is still uncovered – hence the reason things like the ammo drum just get chucked to the side of the field. Mind you, if you were to wander down the track today, you wouldn’t find the ammo drum. Much of it is much nearer to home now! !